I wasn’t sure if I wanted to buy Madden 25 since the previous installment allows roster updates, however recently I was drinking a beer and getting down on some ‘Connected Careers’ in my 7th season as Denver Broncos QB, fresh off of the off-season the Broncos trade their current TE Jacob Tamme for none other than Aaron Hernandez. Now this is my fault because I didn’t update the rosters before I started it and I asked myself what was next, trade me for Michael Vick and OJ Simpson will come out of retirement? None the less it felt like a sign that I had to get a copy Madden 25. Now not everyone else had the same experience as I did but it is apparent that everybody wanted Madden 25. The popular NFL game sold over 1 million units in North America within the first seven days! Several stats were thrown out in the open by Electronic Arts but the one they are touting the most is over 300 million hours of Madden Ultimate Team has been played since its release also announcing that this past Saturday was their biggest day for overall net revenue since the release, specifically on Madden Ultimate Team. 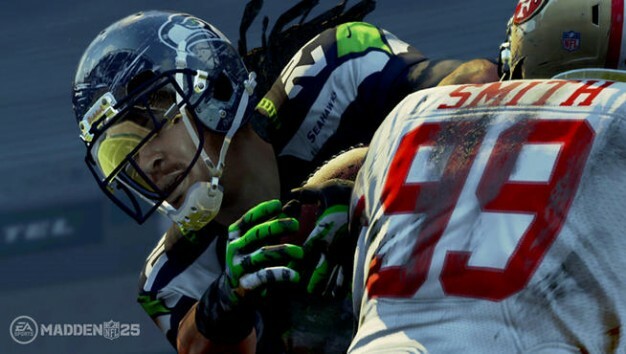 Andrew Wilson, Executive VP of EA Sports had this to say, “It’s a big year for our fans as we launch Madden NFL 25 for two different hardware generations, and we’re pleased with the early results for the Xbox 360 and PS3. We’re confident we can sustain this momentum as we move towards the launch of next generation consoles this Fall with the most innovative Madden NFL yet”. EA Sports among other big studios are in a unique position this year with the next gen consoles, releasing their franchise games months ahead of the next gen installments. This may be a big money maker for those involved at EA Sports and the others that are releasing current gen games before the latter. Madden 25 is currently out for PS3 and Xbox 360 and will be in stores for PS4 and Xbox One sometime in November.